All sites require a 2-night minimum on weekends. Campsite check-in is 2 p.m. or later, check-out by 1 p.m. Due to our high volume of traffic we cannot offer early check-in or late check-out on any campsite. There is a three night minimum for holiday weekends. Rental units check-in is 3 p.m. or later and check-out by 11 a.m. Due to our high volume of traffic we cannot offer early check-in or late check-out on any rental units. There is a three night minimum for holiday weekends. A cash cleaning deposit of $50 and credit card is REQUIRED UPON CHECK IN. If the rental unit is left dirty, the cash deposit is non-refundable and the credit card will be billed for any additional damage. Advanced reservations are requested. All reservations must be paid in full at the time of booking by VISA, MasterCard or Discover, or must be paid by check/cash within 3 business days. When making a group reservation, you must have individual names assigned to each site that you are reserving, the camper type, size, number of people, and number of pets (2 max). There is a $25 rescheduling fee if you have to call and change the dates of your reservation. Passport America members receive a 50% discount and can only use the PA membership Sunday-Thursday to receive that discount, otherwise will pay full price Friday/Saturday. Campsite rates are based on total of 2 adults and 3-4 children under the age of 18 years and ONE car per site. This also applies to group camping. Your reservation for a campsite includes 5-6 persons (2 adults, 3-4 children). You cannot invite non-registered persons to camp on your site. One vehicle is included with your rates, any additional vehicles are $5/night. Additional cars must be tagged. One dog (non-aggressive breed) is included in the rate, $10 fee for extra pets (2 max) per campsite. Must be 21 years or older to register and stay on a site. Pets are welcome (1 per site, max of 2) as long as they are kept on a leash and quiet and never left unattended outside of your camper. You are expected to clean up after your pet. Pets are not allowed in any building, rental unit, bath house, swimming pond area or on the beach . All pets must be up-to-date on their vaccinations before visiting our facility. No vicious breeds (Pitbull, Rottweiler, German Shepherd, Doberman). Dogs must get a tag at the office upon checkin. 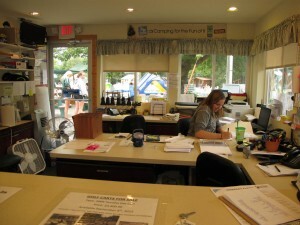 For the enjoyment of all our campers, especially those with children, we enforce “quiet hours” between 11 p.m. and 8 a.m.
A cleaning deposit of $50 and a credit card are REQUIRED upon check-in. Upon departure, the cleaning deposit will be refunded if the unit is returned to the same condition it was in upon arrival. Credit card will be charged for any damage. Smoking is not allowed inside rental units. Pets are not allowed inside or outside rental units. Fine $50 to $200. Registered campers only. You cannot invite additional non-registered persons to camp in a rental unit. Includes use of all common areas at the campground, water (approx. April 15 – October 15), and garbage. $2,995 per year plus $164.72 sales tax. Sewer transfer tank, electric, and pump-out services are billed separately. Visit the office for a list of open seasonal sites or sites with camping units for sale.